The Natchez Trace – Let's Go RVing! What a delightful day. The weather could not have been more perfect for wandering the Natchez Trace. We started in Natchez at the Southern Terminus and traveled until we reached mile post 41.5. During that time we made several stops along the way. Our first stop was at the 10.5 mile post at Emerald Mound. It is the second largest Mississippian Period ceremonial mound in the United States, surpassed only by Monk’s Mound in Iowa. 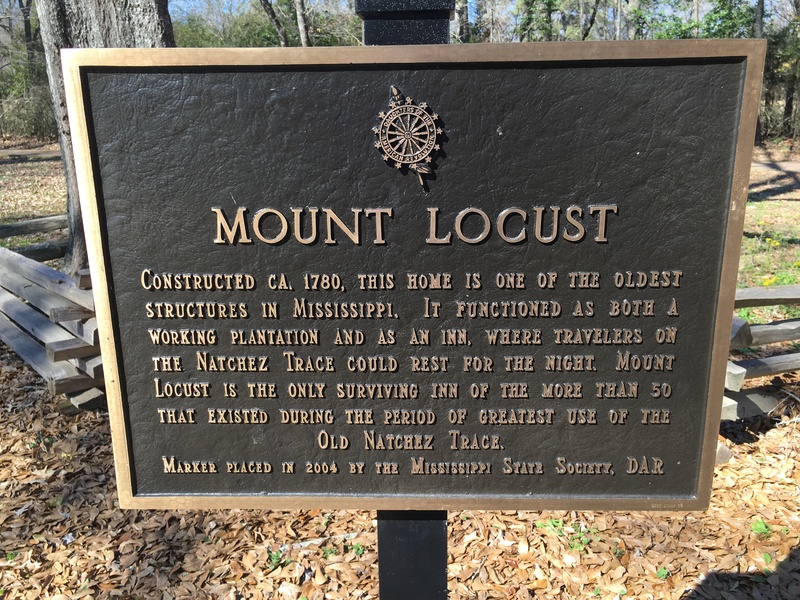 Built by the Mississippians (called this because of the concentration from the Mississippi River Valley) the 35 foot high mound covers 8 acres and measures 770 feet by 435 feet at its base. Two secondary mounds sit atop the primary mound making the total height about 60 feet. 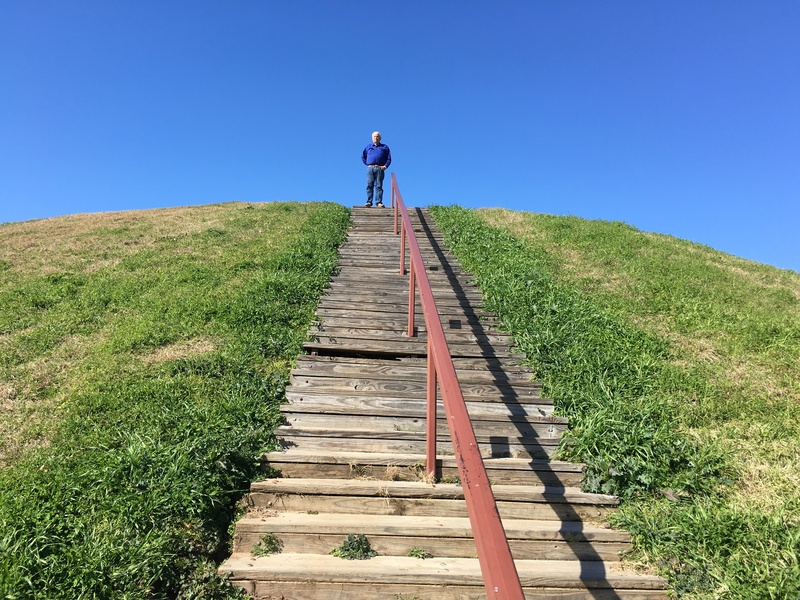 There are steps leading up to the top of the mound and we climbed all the way up to see an amazing view of the grassy primary mound. Of course Jerry questioned where they got all of the dirt to build the mound. The builders carried baskets and may have collected the dirt by digging with sticks or their hands whenever they found the perfect dirt only to take the baskets to the mound, empty them and then start anew. No one knows how long it took to build it. Our next stop was at mile post 15.5 at the Mount Locust Inn and Plantation. There was a volunteer park ranger on duty there so we got a great deal of information about the area. He and his wife are volunteering there for 3 months and living in their 37 foot motor home with full hook-ups. They work four days a week and then have the rest of the time to visit the area. Although Mount Locust had a rocky beginning it eventually ended up in the hands of Paulina Ferguson Chamberlin. She had married William Ferguson and operated the farm with him for several years. After his death she married James Chamberlain who was an overseer at the farm and they continued to grow the farm. Although she lost both of her husbands she continued to prosper the farm. As the travelers would come by her house she would let them sleep with their sleeping bags on her porch for $.25 as it was better than sleeping under a tree. She also had a tap room in the center of the house where one could buy something to drink. This was very significant as this was a period of time when women were typically shunned from business but Polly was an astute business woman. Despite losing two husbands and raising 11 children she prevailed in a difficult era. By this time we were getting hungry so we decided to try to locate the Old Country Store which has been written up as a craft and café that has wonderful fried chicken. Why oh why do we always end up on a dirt road. We headed out for Lorman and somehow missed it so we turned around and I put Lorman in the GPS. Gypsy took us down a long dirt, sometimes graveled, sometimes briefly paved road that eventually led us to the correct highway and we accidentally suddenly found the restaurant. When we entered the owner, Mr. D was singing to the diners about his grandmama’s cornbread. He welcomed us on in and we took a seat and then someone was promptly at our table getting our drink order and then encouraging us to try the buffet. Besides the incredible fried chicken the buffet was full of vegetables, biscuits and to top it off they brought me a split hot peach cobbler and raspberry cobbler topped with ice cream. Ah, sugar delight! As we were eating Mr. D came over and serenaded us and later came again and I was able to video it. Though the outside of the restaurant is quite unassuming the food is delectable and has been featured on TV. With our appetites fully sated we headed to the Windsor Ruins. We have been to a couple of ruins before and Jerry was not impressed so he asked me to let this be our last one. I told him to just wait because he might change his mind and he did! Indescribable and again another sad story. When we arrived another couple was there and an older lady was talking to them. They left and she turned to me and asked me if this was my first time there and when I answered yes she begin to tell me about the ruins. I later told her I wished I had recorded her remarks because she was an absolute fount of information. Not only had she worked with the local Chamber but she also knew one of the descendants. Construction on the home began in 1859 and was completed in 1861 but sadly the owner Smith Daniell only lived there a few weeks before he died. During the Civil War the Union took over the house and used it as a hospital. There is a large oak tree in the front and the lady told me that that was where the amputated arms and legs were put until they could be buried. When the Union left they ordered that the house be burned down but the lady of the house went to the captain and told him that she had let her children go hungry while she looked after the sick soldiers and he better not burn her house down and he didn’t! That was done by a guest at a house party in 1890 when he left a lighted cigar on the upper balcony and everything except the 23 columns, the iron balustrades, and the iron stairs burned. The iron stairs are now at housed at Alcorn State University located nearby. The road to our next stop was long and winding and it often had deep gorges on the sides. It reminded us of the roads in Mammoth Cave, Kentucky. Suddenly Jerry said he saw an armadillo so I asked him to stop so I could get a picture. As far as I can remember I have never seen an armadillo in the wild before. We certainly don’t see them in North Carolina! He must have been young and foolish because he continued to eat grass and he didn’t pay me a bit of attention as I took his picture! We were planning to head for the Sunken Trace next but the lady at Windsor Ruins suggested that we go through Port Gibson to see the pink Presbyterian Church. The steeple is a gold hand with the index finger pointing up. Really? Well we went and yes indeed that’s what we found. The story goes that the preacher who had the church built was a fire and brimstone preacher with his arm frequently raised and his finger pointing in the air. Sadly the first service held in the church was the funeral of that preacher. Although we were told that the church was opened and we should go in to see the chandeliers which were from the Robert E. Lee steamboat Jerry was reluctant to go in so we skipped that part. We headed on out to the Sunken Trace at mile post 41.5 and easily found it. It’s a portion of the deeply eroded or sunken Old Trace. We were told to imagine ourselves walking that land where a broken leg or arm could mean death for a solitary traveler. I can imagine the mosquitoes, the heat and of course those pesky reptiles. I’m not sure I’d want to be walking there in the spring or summer. We were already told not to put our hands anywhere that we couldn’t see. I didn’t have to be told twice and I did watch where I walked. After all, it was a bright sun shiny day and you never know what may come out to bask in the sun. We decided then to head on back to the campground and since it was such a lovely drive we stayed on the Trace. I can only imagine how beautiful it must be in the spring and summer when everything is lush and green. The only green we saw were the shiny leaves of the magnolias. Because of the way our coach was parked (under a leafless tree) we were unable to use our Dish. The campground had no cable TV so Jerry had the pleasure of watching the Super Bowl on his iPad! Helen Jo and I caught up on everything by phone and by then it was half-time. The Carolina Panthers were losing so I turned in for the night! Previous postThree Town Houses and Two Cemeteries in One Day!